HomeCard GamesArkham Horror The Card GameEchoes of the Past Mythos Pack: Arkham Horror LCG Exp. 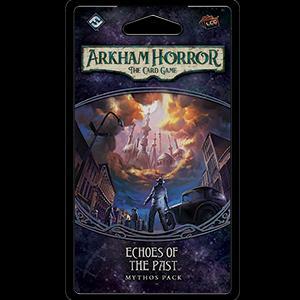 Echoes of the Past Mythos Pack: Arkham Horror LCG Exp. The King in Yellow has come to Arkham! You`ve caught the performance, and now find yourself drawn into the maddening web of powerful forces and sinister events that seem to surround the mysterious play. In Echoes of the Past, the first Mythos Pack in The Path of Carcosa Cycle for Arkham Horror: The Card Game, you head to the Arkham Historical Society, hoping to learn more about the play. But, what you actually find will shatter your sanity! Fortunately, thirty new player cards (a complete play set of each) enhance your investigator`s ability to remain calm and composed in the face of unthinkable horrors!